Therese's ornament is so beautiful as is yours Karen. This is the only HOP that I participated in this year and I HAD to, as well! It's just special to receive a handmade gift, especially at Christmas! 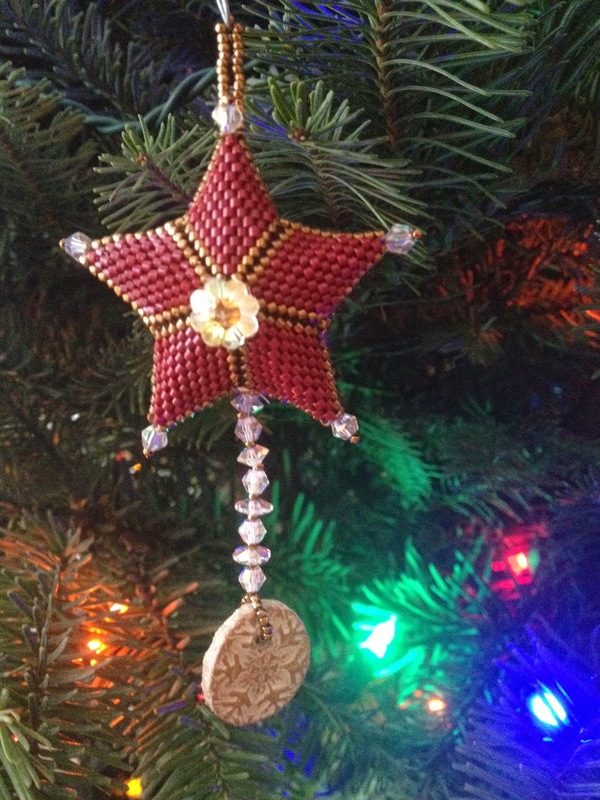 I LOVE Therese's ornament - the star is perfectly puffed! :) The needle case - OMG- I gasped! 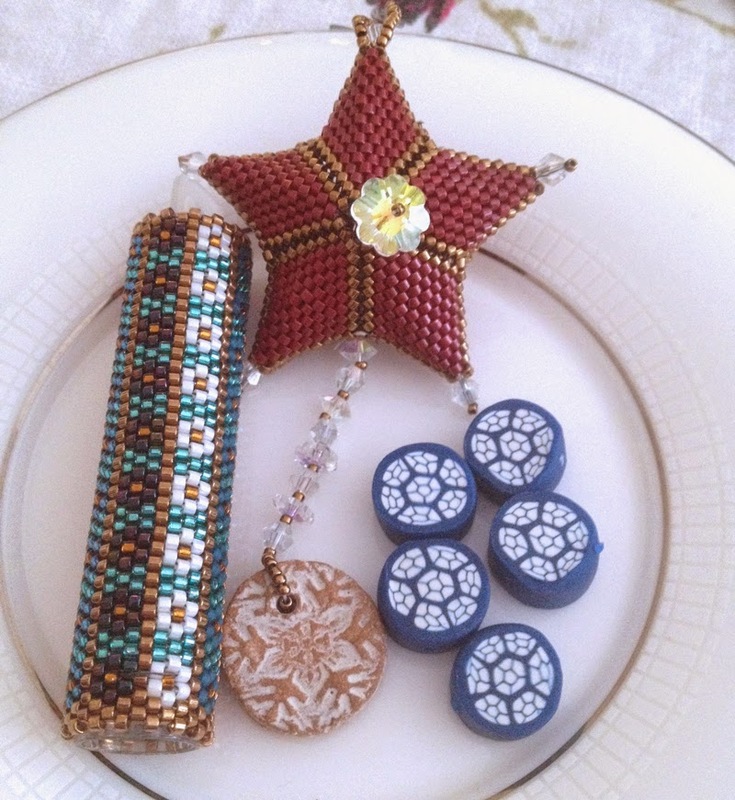 It almost makes me want to try seed beading again (almost...)! I love that as much as the ornament! And BEADS! What a wonderful gift of treasures you received! Your ornament to her was PERFECTION - the perfect amount of sparkly and crisp, winter colors! Beautiful! 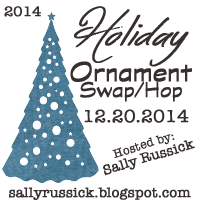 I am still so thrilled that you were my partner in this year's swap/hop. I look at my ornament everyday on my tree it is just so pretty in will all my other treasured ornaments. I hope things are getting where you can take a breath and enjoy the Christmas Season with your husband. Thank you again for your precious gift. Wow, and again, Sally paired the perfect people! She sent you such wonderful things, and your ornament is amazing too! Merry Christmas! So cool! Polymer and seeds. I love seeing people work in multiple mediums - Im glad Im not the only one! Gorgeous work! Off to see what YOU made... Happy Holidays! And congrats on the book! What a special ornament. This star is just awesome and should be treasured. Love it. Lovely ornament... I should make myself a needle case .... much classier than the paper bag I currently use. Congratulations on the book launch. Hope you have a wonderful Christmas holiday! I agree - a lovely ornament - and the one you sent is equally fabulous! I love Therese's work! Her ornament is amazing. The colors are so pretty. I took a peek at your ornament also and it is also amazing! 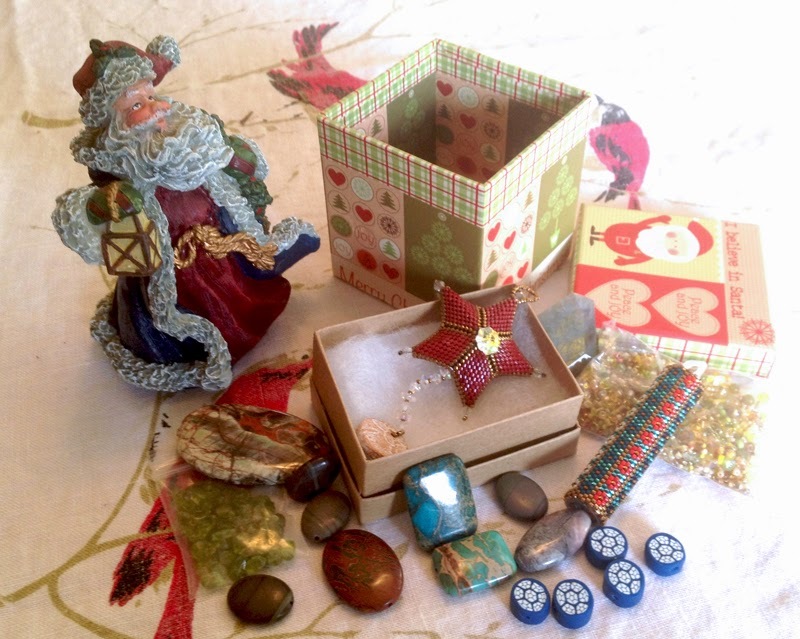 I love the freeform and the falling stars -- so great for the holidays! I am so excited about your book. CONGRATULATIONS! Have a wonderful Holiday! Hi Karen, Therese's star is absolutely beautiful. The needlecase is cool too. All of the extras were a very nice addition. The freeform ornament you made her is wonderful too. I love the wintery colors you chose. What a beautiful star! So much work in these beaded ornaments, it makes my head spin! Wow! You got a wonderful box of goodies from Therese! The 3d star is such a beautiful and intricate design. and the pattern and color palette of the needlecase is right up my alley. I stopped at Therese's blog before stopping here and true to form you created a unique design that is STUNNING!! I love all the beady texture and the fibers!! Beautiful!! Thank you so much for participating in the hop I know how hectic it has been with the release of your book! I owe you an email concerning that book!! !